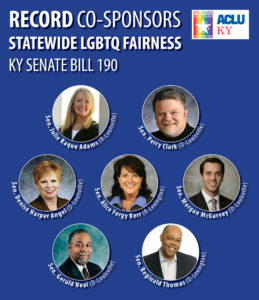 Kentucky Senate Minority Floor Leader Morgan McGarvey (D, 19-Louisville) has introduced LGBTQ-inclusive Statewide Fairness Law Senate Bill 166 with a record number of bi-partisan co-sponsors, including Senate Majority Caucus Chair Julie Raque Adams (R-Louisville), Senator Alice Forgy Kerr (R, 12-Lexington), and first-time co-sponsor Senator Julian Carroll (D, 7-Frankfort), former Governor of Kentucky. 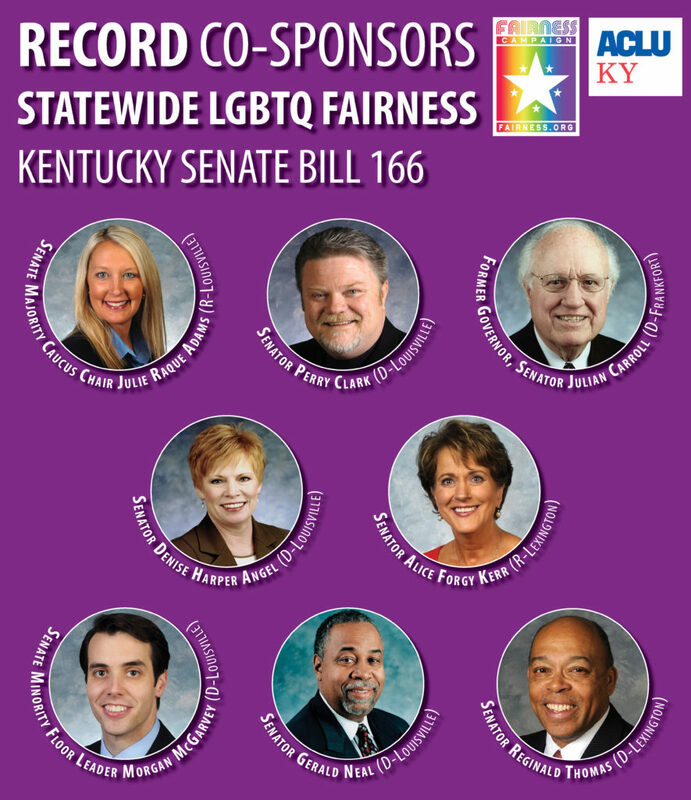 A new record 21 co-sponsors have also joined Rep. Mary Lou Marzian’s (D, 34-Louisville) Statewide Fairness Law House Bill 164, with the most recent addition of Rep. Dennis Keene (D, 67-Wilder). Both Statewide Fairness Laws would update the Kentucky Civil Rights Act to add sexual orientation and gender identity among protected classes in employment, housing, and public accommodations discrimination. Kentucky is one of 28 states that have not updated statewide civil rights laws to include LGBTQ people, leaving nearly three-quarters of Kentuckians living in a place where LGBTQ discrimination is still legal. Ten Kentucky cities have adopted local Fairness Ordinances, covering approximately 27% of the state’s population–Louisville (1999), Lexington (1999), Covington (2003), Vicco (2013), Frankfort (2013), Morehead (2013), Danville (2014), Midway (2015), Paducah (2018), and Maysville (2018). More than 250 Kentucky employers, from major corporations to small, locally owned businesses, have joined the Kentucky Competitive Workforce, which supports the Statewide Fairness Law. What Happened in Frankfort in 2018? From the awful pension and budget crises, to the racist “Gang Bill,” and endless attacks on reproductive freedom, racial justice, our teachers, workers, and more, the 2018 Kentucky General Assembly will be one seared into our collective consciousness for years to come. When it came to LGBTQ legislation, with your help, we were able to maneuver a number of quiet victories that shouldn’t be missed, beginning with our record number of co-sponsors on Senator Morgan McGarvey’s “Statewide Fairness Law” Senate Bill 190. Lexington Republican Senator Alice Forgy Kerr joined Senator McGarvey and five others for the largest Senate contingent in history in support of LGBTQ discrimination protections. Though a handful of legislators introduced an anti-transgender “Bathroom Bully Bill” for Kentucky schools—House Bill 326—it was “dead on arrival” in the House of Representatives and never even received a hearing in Chairman Bam Carney’s Education Committee. You’ll likely remember the “religious freedom “ bill, which we dubbed the “Sore Loser’s Law” or “Overkill Bill,”—House Bill 372—which was seven pages of opposition to same-gender marriage, and opened the door for businesses and charities to deny service to LGBTQ families, even in cities with Fairness Ordinances. By the time the bill was posted in committee, it was host to a frightening 46 co-sponsors. But in a surprise bi-partisan move by lawmakers, new language was introduced via a committee substitute that replaced the discriminatory provisions of HB 372. The new version of the law would have simply reiterated existing protections pastors and religious entities already enjoy, without opening the door to discrimination. The improved language passed out of committee unanimously and was approved by the House on the consent calendar without debate. The Senate ultimately never took up the issue. One of our other chief concerns this session was Rep. Stan Lee’s “HIV Criminalization Bill” House Bill 193. In its original form, HB 193 severely criminalized people living with HIV/AIDS and other communicable diseases who used saliva or other bodily materials as a projectile against a peace officer. It initially created a Class C Felony for the offense—with a mandatory five-year prison sentence—even if the bodily material could not transmit HIV, like saliva. Rep. Jason Nemes worked closely with the Fairness Campaign and ACLU of Kentucky to write new language for HB 193, which reduced the penalty to a Class A Misdemeanor, created a better definition for “communicable disease” that didn’t single out people living with HIV/AIDS, and mandated that the risk of transmission be consistent with prevailing epidemiological evidence. Rep. Nemes’ amendment passed the House, and after a little wrangling, the better language also passed the Senate with the help of Judiciary Committee Chairman Whitney Wester eld. On the final day of the session, the substantially improved HB 193 passed the House on concurrence, sending it to Governor Bevin’s desk to become law. We still have much work to do, as we brace ourselves for another di cult General Assembly in 2019, but for now, we will focus on the upcoming Primary and General Elections. C-FAIR, our Political Action Committee, has released endorsements in 25 important Primary Election races across Kentucky. You’ll find them just inside this newsletter. Regardless of how you vote, we just hope you do vote! Thank you, endlessly, for your work and support.